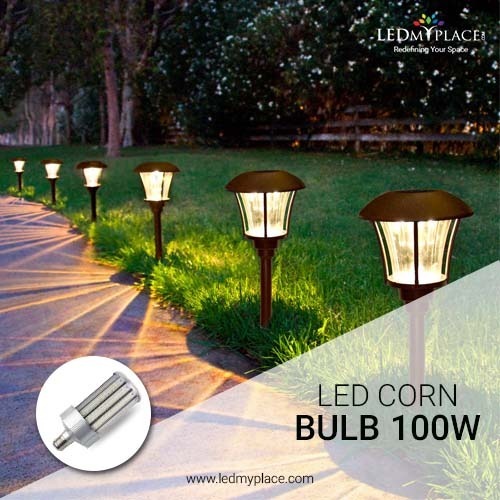 LEDMyplace is having a wide category of the outdoor lighting fixture and from all 100 watt LED Corn Bulb is the most preferred and purchasable product. Its 360-degree of beam angle emits the brightness all over the space and eliminates all dark-spot. It is having a high CRI>80 which shows the object and surface as real as it seems in daylight. 100 watt LED Corn Bulb offers you 5700K of color temperature with the lumens output up to 11,000+lm, and it can replace your 400-watt metal-halide bulb. This 100 watt LED Corn Bulb is having a big inbuilt heat sink which passes heat away and doesn't leads fixture gets heat while working. As mentioned this lighting fixture is UL & DLC Listed which makes it eligible for rebate as well.